This python differs from other pythons in that there are no heat sensitive pits on the lower jaw. It usually occurs in open forest and woodland areas. It preys on other reptiles, birds and mammals. 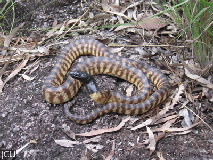 The body is banded brown and cream, this contrasts with the shiny black head, neck and throat.